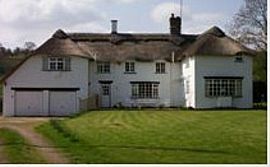 White Cottage Bed and Breakfast is a 300 year old thatched cottage, set in its own peaceful 3 acres, with the river running through the middle of our field. The house has been completely renovated in the last six months, from a new thatch, right through to the new floorings, light fittings and furnishings. 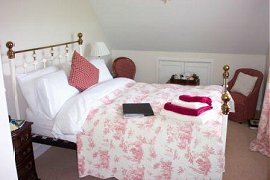 Situated in the hamlet of Athelhampton, 200 yards from the 15 century Athelhampton House and Gardens. An area famous for the Tolpuddle Martyrs, Thomas Hardy's cottage and Kingston Mauward are nearby, as are many other attractions. We are 6 miles from Dorchester and 12 miles from Weymouth. White Cottage is an ideal location, surrounded by forest and fields - it's perfect for rural walks, bird watching and cycling. (Many different types of birds can be seen up-close, with a local family of pheasants which walk through the garden). 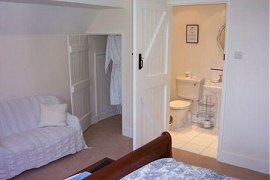 This is the larger double room with an ensuite shower room. It has views over the garden, the river, fields and hills beyond. The room is large enough to put up an extra bed if required. This is also a double with its own private bathroom opposite. 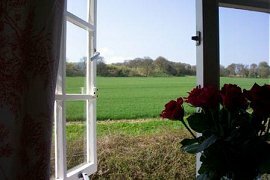 This room has beautiful views of fields and woodland. Each room has, a mini fridge with complementary bottles of water etc, dressing gowns, hair dryers, complementary fruit and fresh flowers. 300 year old thatched cottage. Set in its own peaceful 3 acres. Situated just of the A35 on the Athelhampton Road, in the hamlet of Athelhampton between the villages of Puddletown & Tolpuddle. £35 per person per night. This includes VAT and breakfast. £30 per person per night. This includes VAT and breakfast. 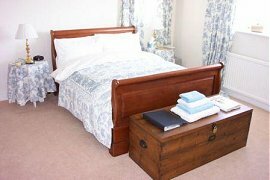 We charge £10 extra for a single occupancy.